A Re-examination of The Robert Harbin Magicassette - Craige M. Snader, Jr.
Our Secret - Craige McComb Snader, Jr.
Magic from Holland - "Ring"
Crazy Calling Cards Cwickies - Joe Ricciardi, Jr. 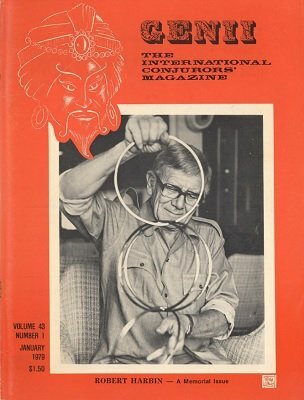 The Mental Mysteries and Other Writings of William Larsen, Sr.
Card Changes - J & J Card Co.
Five of Diamonds to Nine of Diamonds - J & J Card Co.
Cover - Danny Dew "The Phoenix Philosopher"
The Watch Thing - National Magic Co.
A Tricky Piece of Business - J & J Card Co. Frost's Comprehensive Calendar for the years from 1753 to 2002 - reprint - Craige Snader, Jr. Catalog #10 (Audio Visuals) - Gospel Services, Inc.
Card Trek - Mecca Magic Inc. Mental Mysteries - William Larsen, Sr.
Eccentric - Steve Dusheck, Jr. Improved Ribbon Eternal - Steve Dusheck, Jr. Inner Sanctum - Steve Dusheck, Jr. Comedy Changing Card - J & J Card Co.
Dusheck's Dingbat - Steve Dusheck, Jr.
Pezazz - Steve Dusheck, Jr.
Pad-I-Add-Trix - Steve Dusheck, Jr.
Giz-Gaz - Steve Dusheck, Jr.
Houdini Escapes Again - James Swoger House of Enchantment Inc.
Who Are We Kidding? - George Robinson, Jr.
Supersonic Prediction - Tricky Business, Inc.